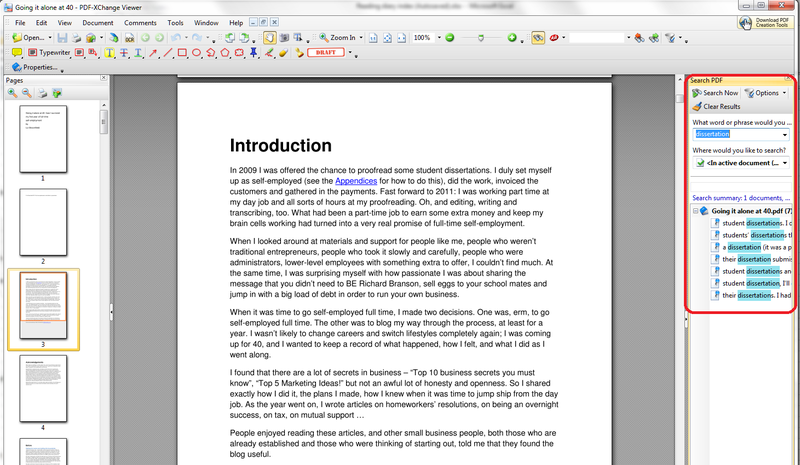 How do I change the colour of text in Word? 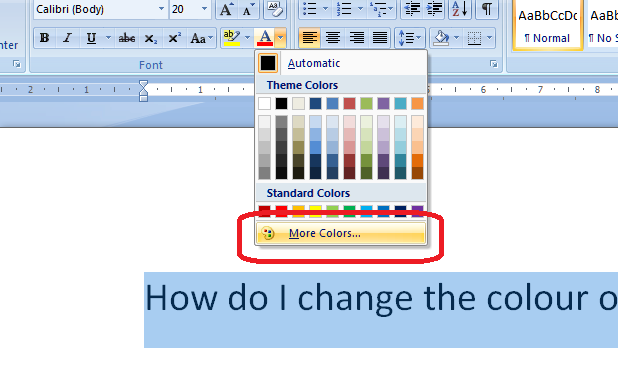 How do you change the colour of the text in your Word document? 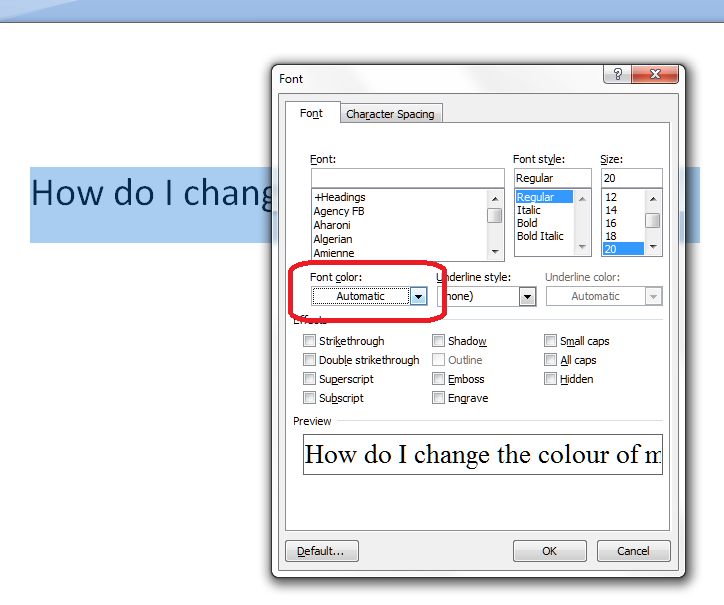 Why would I want to change the colour of the text in my document? You might want a section of the text to stand out, to match your company branding or to look attractive on a menu or other display document. It’s easy to change the text colour to do this. 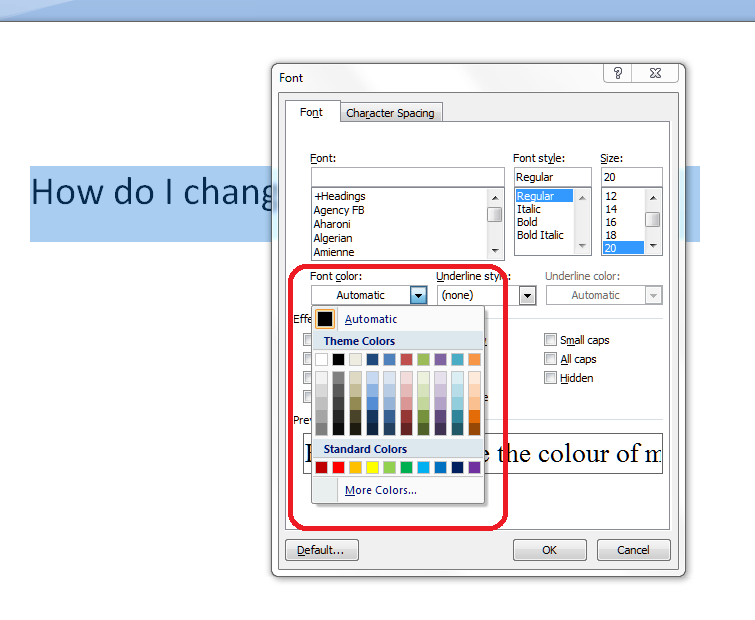 Note: don’t use changed text colour to alert your proofreader/editor to something you want to do – read this article to find out why. 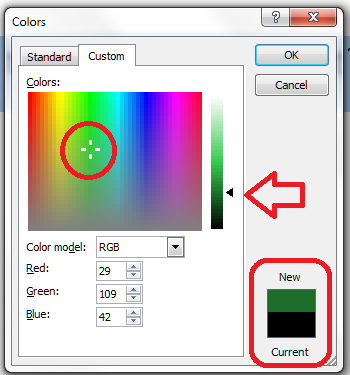 To see how to use this palette, hop down past the next section and join me at “How to select your colour”. 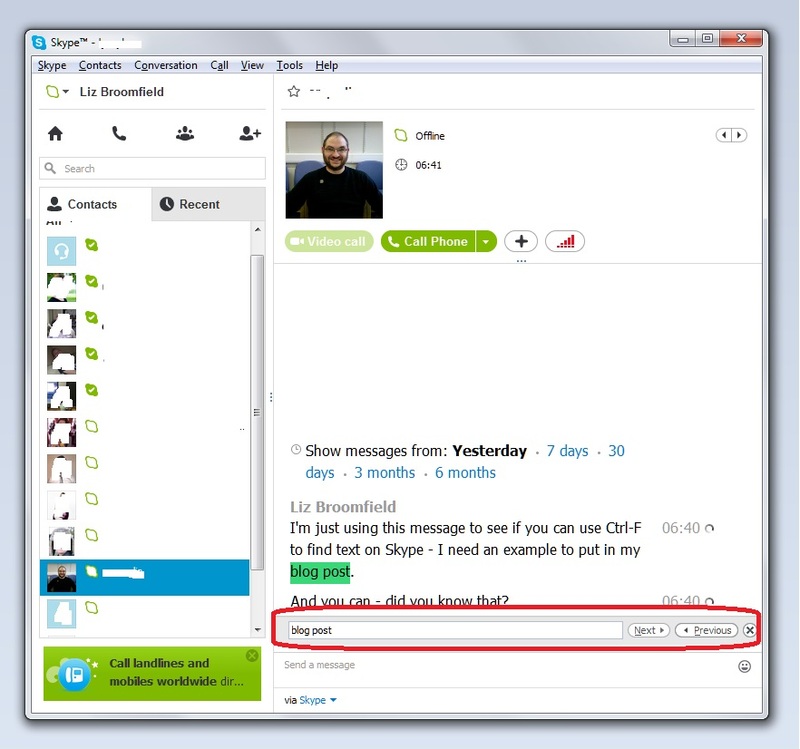 You will now find not one but two ways to change the text colour – a button with an A underlined in red (circled) and a Font menu (arrow). If you click on the button, you’ll get to the same point as in the section above. Click on Font for now ..
How do I choose a custom colour for my text? … and have a huge range of colours to choose from. Here, you can click on the colour and then move the arrow up and down to adjust the amount of black in the colour, and it handily shows you the original and new colours at the bottom of the dialogue box. 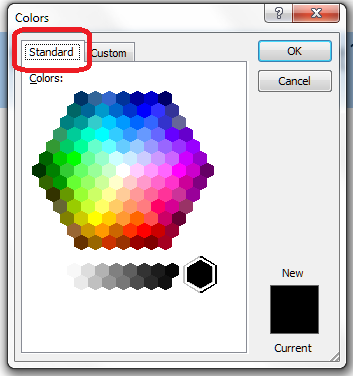 Now you know how to change the text colour in Word to an almost infinite number of colour choices. 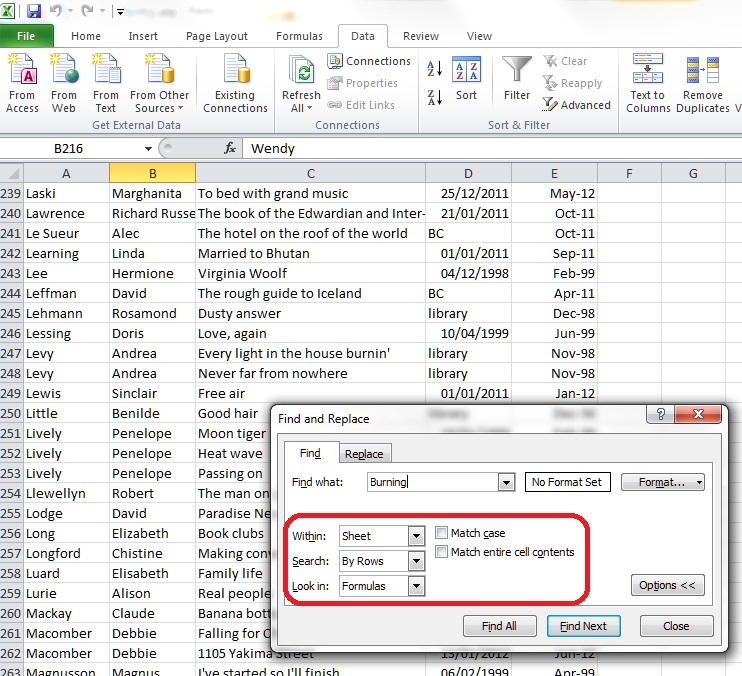 You can use the same button or right-click and font option in Excel and PowerPoint, too. English spelling is rife with these short words that sound the same and cause trouble. Just look at pare and pear and pair, or bear and bare, or peek and peak. But just like those, these two are very different, and their meanings don’t overlap at all! 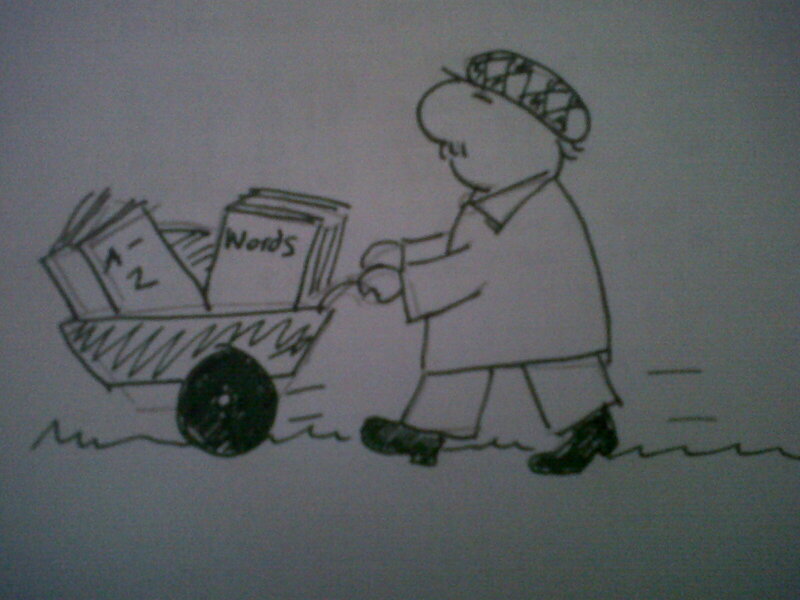 To peer is to look with concentration or difficulty – “I peered at the dusty manuscript in the dim light”. It also means to be just visible – “the sun was peering around the side of the mountain” (the origin of this meaning may be from appear in 16th century dialect). A peer is a member of the nobility in Britain and Ireland, or a person of same age, status, rank or ability as oneself *my peers in the business world are a group of women who set up businesses a few years ago when they were around 40″. As an extension of this, it can mean simple equal (in quality) – “as an editor, he has no peer”. A pier is any long narrow structure e.g. leading out to sea for boats to more on or for entertainment, or projecting from an airport terminal giving access to planes. It is also the pillar of an arch or pillar supporting a bridge, wall between windows or adjacent openings. Its origin is unknown. Today we’re saying hello again to Tone Hitchcock, brother of an old University friend, who I’ve known since he was about 16. I originally interviewed Tone on 5 May 2012, and his plan for the next year? “This time next year, Rodders, we’ll be miwionaires … or at least, doing model and prop work more consistently so that Bryony, my wife, can lessen the amount of hours she works”. So, how’s it all gone? Is Tone a millionaire yet? Has he met any millionaires? (Maybe) and what has he learned along the way? I’m pretty much where I thought I would be a year from the last interview. Not a millionaire yet, but things are progressing well, and, despite last year being much more challenging than I though it was going to be, I’ve made some amazing contacts, and worked on some amazing projects. Bryony hasn’t managed to cut down on her hours yet, but she does have a shiny new job that allows her to be a bit more flexible, so we can work around the boys together really well. Also, I certainly feel more professional than I did a year ago! My working methods have changed a little in that I now am much happier to farm work out if I need to, rather than trying to do all of it myself. I think, just because you CAN do everything on a project, doesn’t mean that you SHOULD. For instance, I enlisted the help of an amazing joiner, and an astounding automaton designer for the Victorian Donation Box I recently completed for Oxford Town Council. I wouldn’t have produced nearly such a good final piece without them, and the time, stress and effort they saved me were well worth the money. I’m still pretty much a one-man band, it’s just that these days (to stretch the image a tad…) I hire in extra session musicians when I need to. The thing that I wish I’d known a year ago is this: Do Not Get Involved With Massively Wealthy, Bonkers And Demanding Clients: They Will Comprehensively Make Your Life A Misery. To provide a bit of background on this, I was contacted by an internationally renowned fashion photographer who also does design work to create some sculptures for a client’s garden in Ibiza. The clients were very exacting, but consistently failed to provide information in a timely way, kept changing their minds, insisted on ridiculous things, and generally had no concept of how a project like this should have gone. I actually lost money on it after all the to-ing and fro-ing, but it is all complete now, and has (at least) provided me with some lovely images for my portfolio. I will also think long and hard before ever working through a third party again, as it made the whole design process somewhat akin to Chinese Whispers. 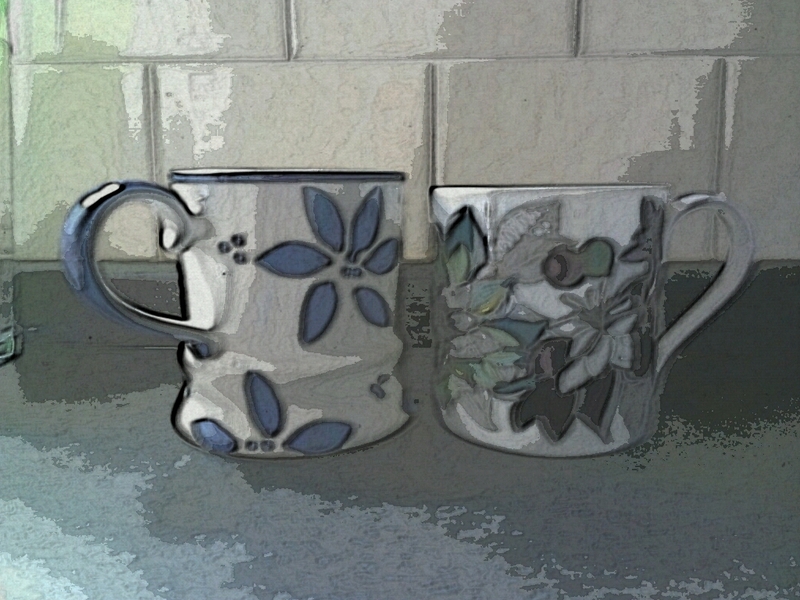 I do now have an excellent relationship with the photographer, though, and we are planning further projects together. Neither of us will work with those particular clients again. I’ve also, as a direct result of this debacle, substantially tightened up the small print in my contract, and am going to join BECTU, the media and entertainent union. They provided me with sterling advice during the worst of this situation, despite me not being a member at the time. I would definitely recommend them to anyone else in my line of work. So… this time next year, Rodders, we’ll DEFINITELY be miwionaires… Well, maybe not, but I will definitely be doing more prop and model work. This last year was testing, but it has also provided a really good foundation to build on. Moreover, it’s also toughened me up a bit professionally, which is a good thing: in common with most artists, the business side of things is not something that comes naturally to me, but it is a massively important part of my work, and shouldn’t be taken for granted. If the paperwork is up to scratch, I can get on with making random bits of weirdness (the fun part) without worrying. See what Tone’s been up to recently at Anthony Hitchcock Art & Design at www.tonyhitchcock.co.uk. You can, of course, email Tone or call him on 07929 272 513. 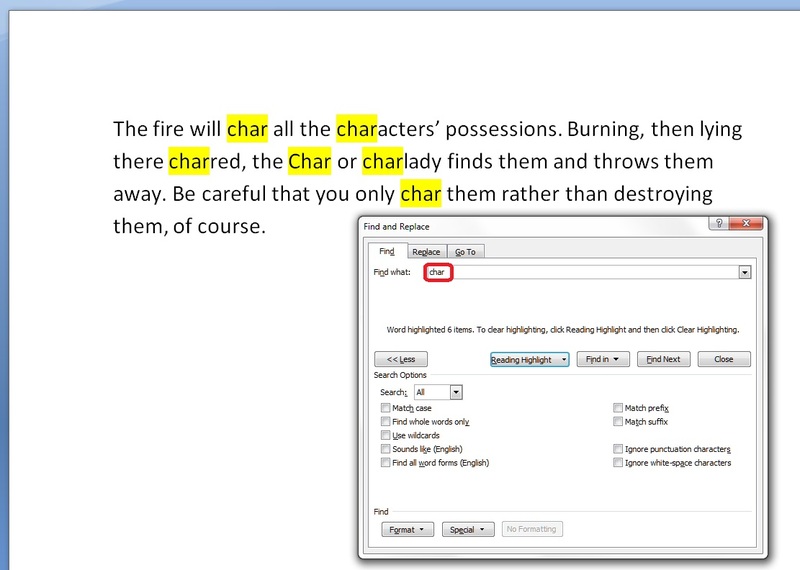 Today we’re going to learn about the wonders of Ctrl-F and how it can help you to search for text almost anywhere. We’re going to look at an overview of the basics in this article, then I’ll go into more detail on advanced searching and replacing in another one. 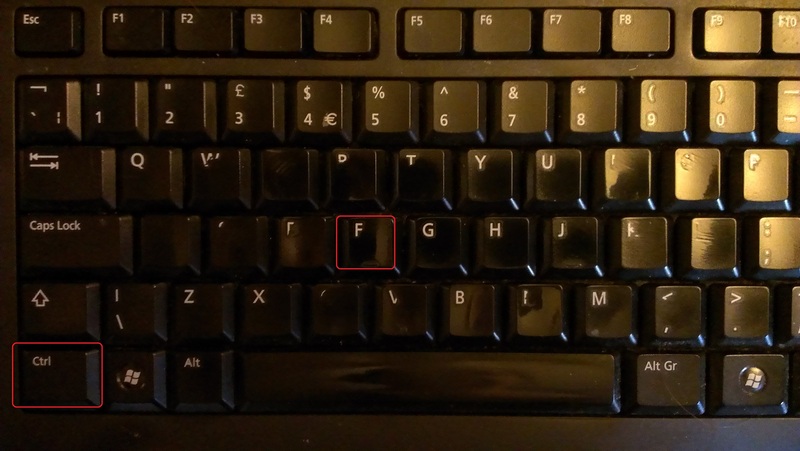 Ctrl-F is shorthand for “press the control key and the F key at the same time“. It’s the way in which key combinations are expressed. You will have one or two Ctrl keys on your keyboard (I have two) and it’s usually easiest to press Ctrl, hold it down, then press F.
If you’re looking at a Word, Excel or Powerpoint document, a web page or, in fact, many other things, you will now be able to search for text in that document, on that page, etc. Let’s go through the different places you can use this. Word is one of the places where searching is most useful. It also offers the largest range of options for searching, and we’re just going to look at the most common today but watch this space for an article on advanced searching. It will usually appear to the side of the document, so as not to obscure the text. 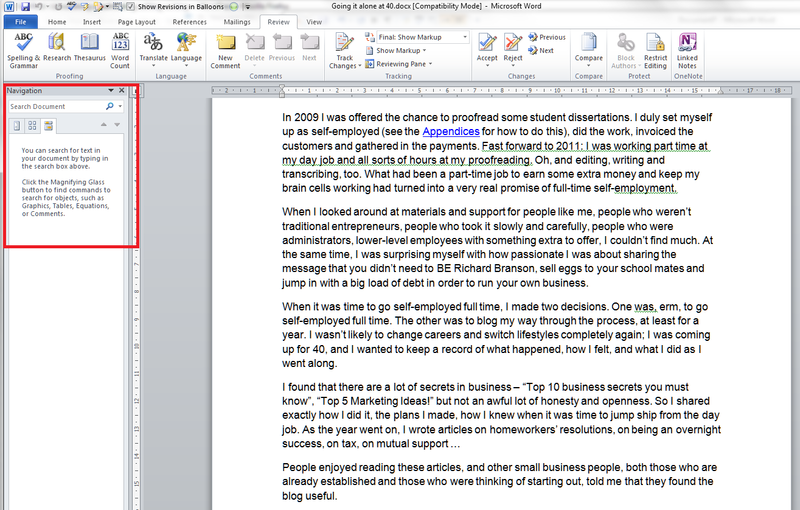 Enter the text you wish to search for, in this case Richard Branson, and press the Find next button (or the Enter key). Word will highlight the text you’re looking for. Here, you have options to match the case, find whole words only, etc. For the moment, we’re going to concentrate on just these two (see the article on advanced searching for the other options). If you choose Match case, it will search for only those words in the exact same case as the one in the search box. 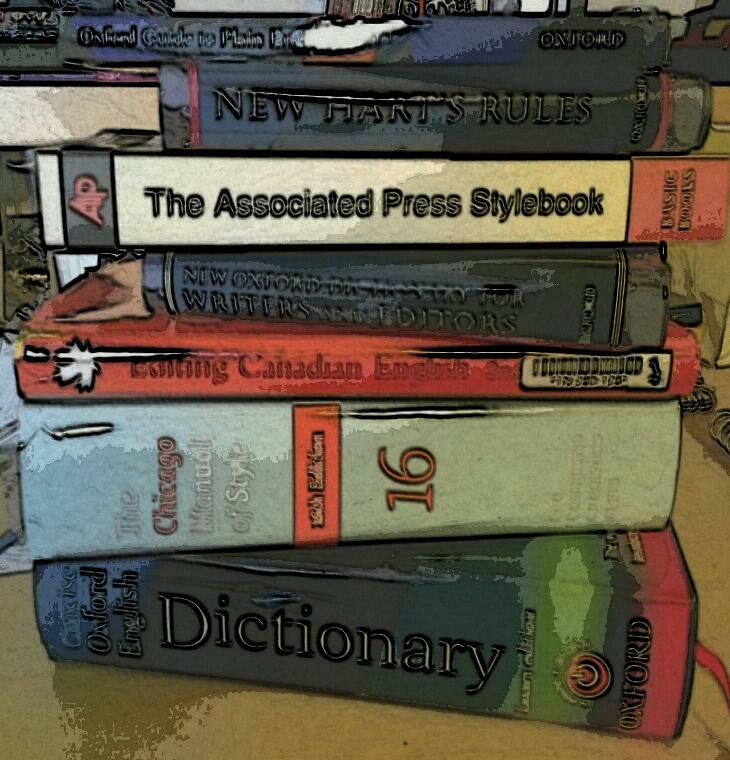 If you choose Find whole words only, it will look for only that text, not that text included in a longer word. We’ll have a look at how that works in just a moment. 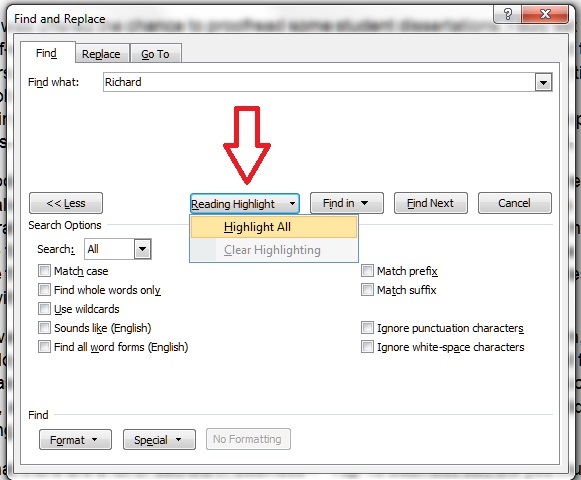 Note: if you change your search term, you will need to Clear Highlighting before highlighting again, otherwise all of the original highlighting is shown. The next option is Find In. This is useful if you only want to search a particular part of the text for your word. 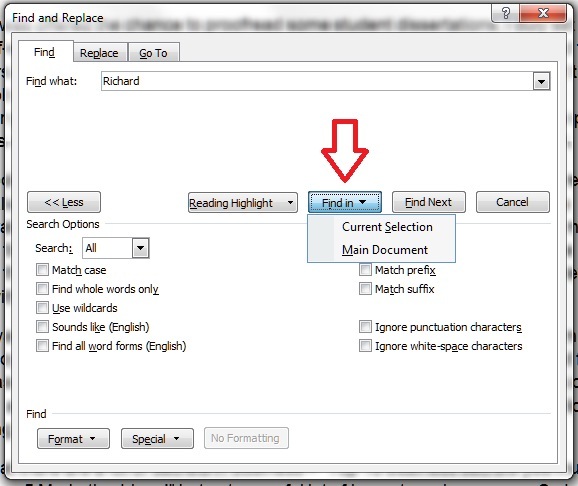 Highlight the section in which you want to search, and then choose Current Selection (or, if you’ve got a section highlighted for some other reason, choose Main Document. 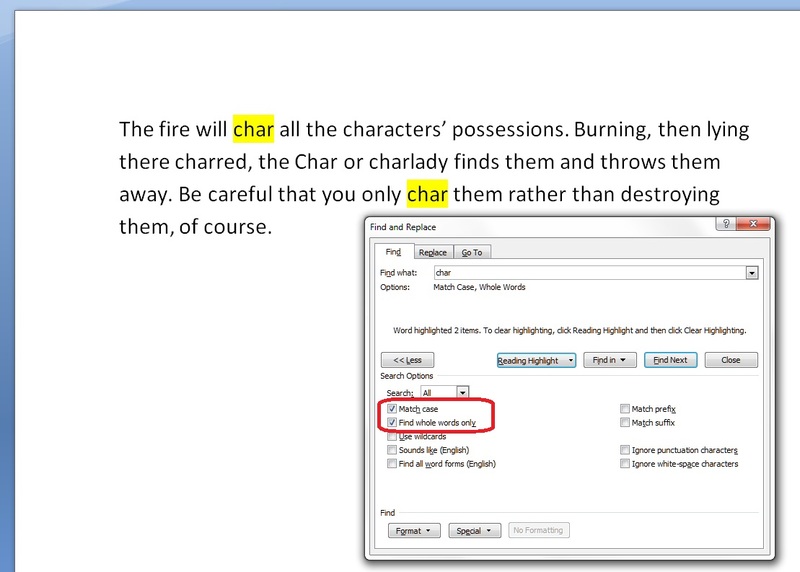 Here, I’ve just searched for char, not worrying about any additional options. You can see that it’s found char, but also character, charlady and Char, because I didn’t specify that I wanted only the word form “char”. Of course, they went and changed this to make it more useful and user-friendly in Word 2010 … I was a bit flummoxed when I first tried to use it, but you can get back to the dialogue box we’ve looked at above, and there are some additional useful features. This is handy, and although you can do more things here to do with looking at the whole document, you can’t immediately refine your search to whole words only, match case, etc. But you can get to that familiar dialogue box. Click the down arrow next to the search box and you’ll be presented with a list of options. We’ll look at the advanced ones next time. 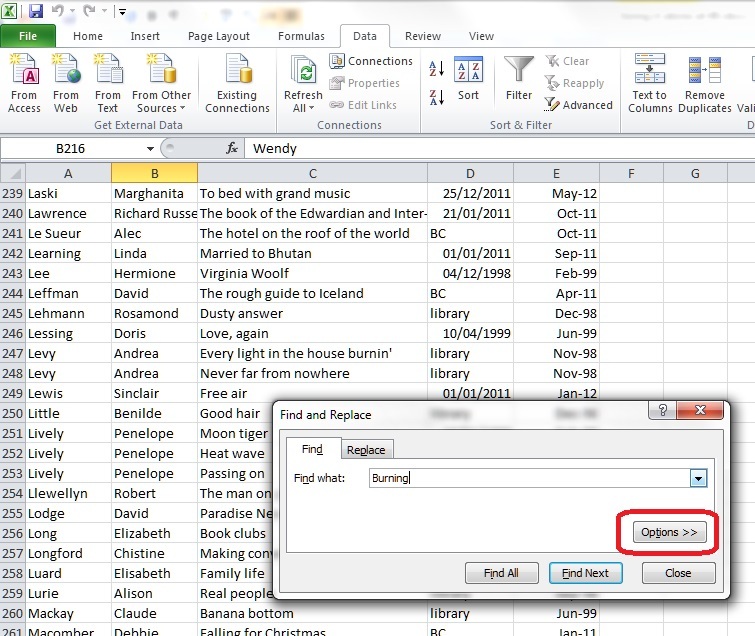 This works the same in Excel 2007 and 2010. 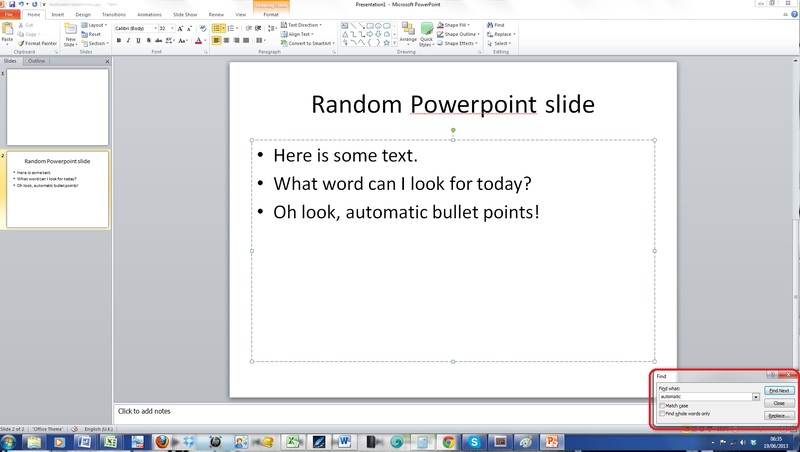 Again, you have enough options to be useful, but not the range of options you find in Word, and again, this works the same in Powerpoint 2007 and 2010. I find this so useful, especially if I’m searching my own web pages for a word I’ve used or maybe misused (I used this a great deal in the great proof-reading to proofreading change I made a few years ago. Please note that these options might change in future as the browsers are updated. One of the few things that you can’t search using Ctrl-F is a pdf document. 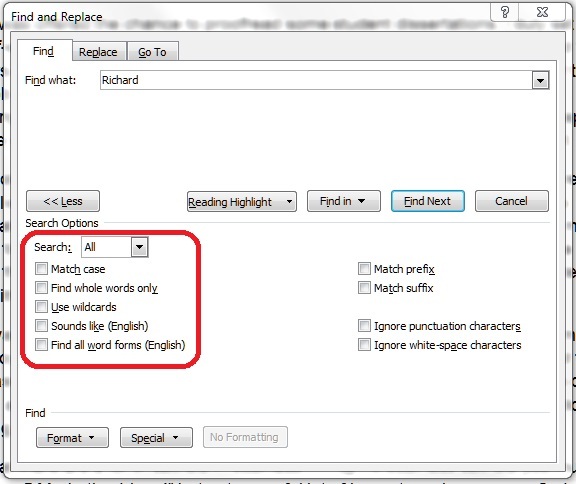 However, most readers (I use PDF-Exchange), as well as having their own search functionality on the page, will allow you to use Shift-Ctrl-F to search! And it works in a similar way in Adobe, too. And I’ve even tried it in my transcription management software, ExpressScribe, and you can use it there, too! Today we’ve learned about how to use Ctrl-F to search almost anywhere in any type of document or application. 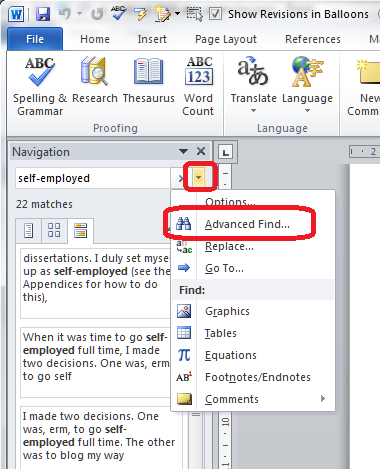 Coming soon – advanced searching in Word and Search & Replace / Go To. If you’ve enjoyed this post and/or found it useful, please take a moment to comment (I’ll just ask you to provide a name and email address; you don’t have to sign in to WordPress) and share the post using the buttons you can see below. Thank you!